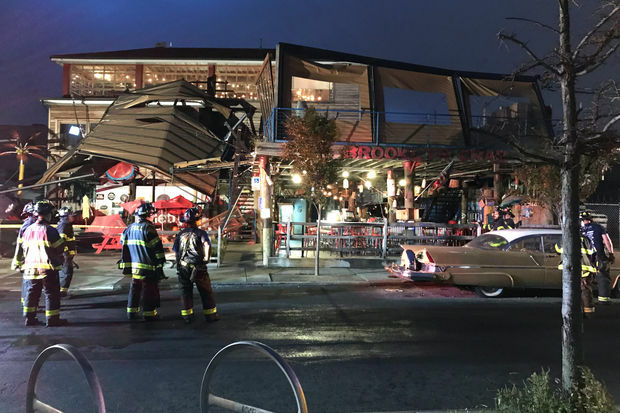 An awning collapsed at Brooklyn Crab in Red Hook on Tuesday morning, likely from the wind, according to the FDNY. ​NEW YORK CITY — Tuesday began with high winds battering the five boroughs that are expected to continue, dragging heavy rains and thunderstorms into the city through nightfall, forecasters said. Wind gusts could reach 50 mph while up to 2 inches of rain could fall throughout the day, according to the National Weather Service, which issued a wind advisory that'll continue until 2 a.m Wednesday. "There's going to be off-and-on showers this morning into this afternoon and very likely into this evening," said NWS meteorologist David Stark. The heavier showers are expected this afternoon into the evening, he added. Service on the 5 train was temporarily disrupted Tuesday morning after a tree had fallen on the track. Rain also caused delays on the Staten Island Rail, due to "slippery rails" in both directions, according to the MTA. High winds likely caused an awning to collapse at Brooklyn Crab, at 24 Reed St. just before 6:30 a.m., according to the FDNY. There were no reported injuries, officials said. "The strongest winds are going to occur during the day today, and once we get after dark the winds are really going to come down," Stark said. Tuesday's high temperature will reach 72 degrees and the low tonight will be 61 degrees, according to the NWS. A thunderstorm and more rain is possible before midnight tonight, according to the NWS' website. Clouds will continue into Wednesday, with a slight chance of rain. The high will be near 66 degrees. Sun returns Thursday, with a high near 63 degrees and a 30 percent chance of rain in the afternoon. The low that night will be around 48 degrees, which begins to usher in cooler temperatures. Stark said that while it will stay above average through the weekend, a weather system is expected by next week to bring in more seasonable temperatures. "There will be cooler air for early next week," he said. "We're starting to get on to the trend of cooler weather."